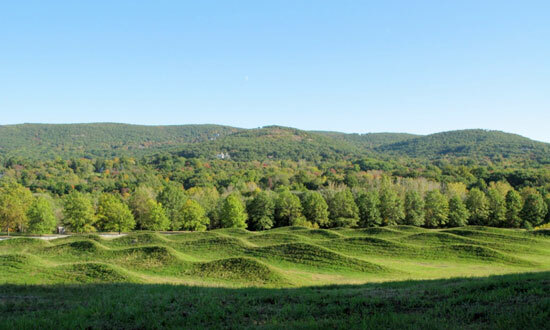 The Wavefield is comprised of seven rows of undulating, rolling waves of earth and grass. The waves range in height from ten to fifteen feet, with a trough-to-trough distance of approximately forty feet. The work at Storm King is the largest site-specific art installation that Lin has created, and it marks a culmination in her series dedicated to the exploration of water-wave formations. Because it is executed in the same scale as an actual set of waves, the viewer’s experience is similar to that of being at sea, where one loses visual contact with adjacent waves. Compound curves allow for a complex and subtle reading of the space in the form of an environment that pulls the viewer into its interior and creates a sense of total immersion.